WEC 9: Cold Blooded from January 16, 2004. Mike Kyle vs. Jude Hargett WEC 9 Jan 16, 2004 (8:30) In a heavyweight main event melee, American Kickboxing Academy’s Mike Kyle who owned all 4 of his wins via strikes including a 12 second KO in his WEC debut was set to scrap with Cesar Gracie Jiu Jitsu’s Jude Hargett in his pro MMA debut. Alex Stiebling vs. Joe Riggs WEC 9 Jan 16, 2004 (14:54) PRIDE veteran Alex “The Brazilian Killa” Stiebling with his 14-5-1, 1NC pro record and coming off of back-to-back wins was set for a dueling WEC debut against Joe “Diesel” Riggs who was on a five fight unbeaten streak including four wins by finish. Olaf Alfonso vs. John Polakowski WEC 9 Jan 16, 2004 (29:06) Scoring back-to-back finishes in his WEC appearances, Olaf Alfonso was quickly becoming a fan-favorite with his pedal to the metal style and was ready for a rumble with The PIT’s John Polakowski who was making his pro MMA debut. Yves Edwards vs. Deshaun Johnson WEC 9 Jan 16, 2004 (25:11) Coming off his fourth UFC win in a row, “Thugjitsu Master” Yves Edwards owned a 24-8-1 pro record and entering the WEC cage for the first time to scrap with fellow first-timer Deshaun Johnson who owned a 5-5 pro record. Tiki Ghosn vs. Nick Gilardi WEC 9 Jan 16, 2004 (8:49) UFC veteran Tiki Ghosn with his 7-3-1 pro record was ready to step into the WEC cage for the first time to tangle with Nick “Savage” Gilardi who was a 3-3 pro and aiming for his first WEC win in his second attempt. 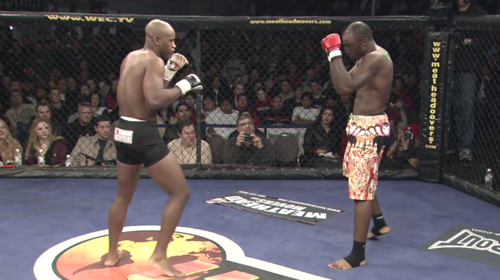 Doug Marshall vs. Lavar Johnson WEC 9 Jan 16, 2004 (15:29) Scoring a fast first round submission to strikes in his WEC debut, Doug “The Rhino” Marshall was ready to get back into action as he squared off with former high school football standout Lavar “Black Superman” Johnson. Chris Leben vs. Mike Swick WEC 9 Jan 16, 2004 (10:34) Knockout artist Chris Leben takes on undefeated Mike Swick to see who will become the first middleweight champion in the WEC. Poppies Martinez vs. Eric Ramirez WEC 9 Jan 16, 2004 (6:54) Poppies “The Tachi Kid” Martinez was enjoying the first win streak of his pro MMA career with three straight first round finishes inside the WEC cage. Up next, Martinez faced Eric Ramirez who was making his pro MMA debut. Rob McCullough vs. Harris Sarmiento WEC 9 Jan 16, 2004 (19:55) Returning to the WEC cage since making his pro debut in it, Muay Thai specialist “Razor” Rob McCullough was riding a four fight win streak into a scrap with the debuting Harris “The Hitman” Sarmiento who owned a 7-7 pro record. Jack Cardenas vs. John Appleby WEC 9 Jan 16, 2004 (8:26) Someone’s getting their first WEC win as Jack Cardenas who had tasted defeat in his first two pro bouts inside the WEC cage was ready for a rumble with John Appleby who was aiming to get his hand raised in his second attempt. Richard Montoya vs. Joe Salcido WEC 9 Jan 16, 2004 (5:51) Securing an ultra-quick rear naked choke win in his debut, American Kickboxing Academy’s Richard Montoya headed back into the WEC cage to tangle with the debuting Joe Salcido who was entering his first pro MMA bout. 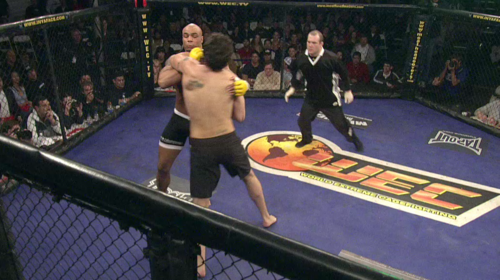 Anthony Gonzalez vs. Pedro Tome WEC 9 Jan 16, 2004 (5:50) Both fighters were aiming for their first professional win in their second try as San Luis Obispo’s Pedro Tome entered the WEC cage for the first time against fellow debutant Anthony Gonzalez. 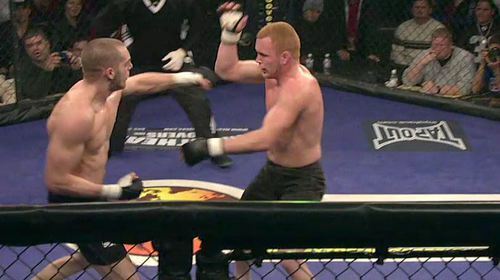 Josh Hayes vs. Tony Asam WEC 9 Jan 16, 2004 (4:52) With their first professional win or loss hanging in the balance, Josh Hayes was scheduled to make his pro MMA debut in the WEC cage against fellow rookie Tony Asam.